As I like to say every December, it was a good year to be a birder! Allow me to reflect a little bit on 2010 and share a few random thoughts and observations. It seemed like a banner year for blue jays and cedar waxwings—two of the best-dressed birds in the neighborhood . . .
My favorite backyard regular, the red-breasted nuthatch, is at the bottom of the pecking order. When one is on the peanut feeder, and a red-bellied woodpecker swoops in, it’s like a Matchbox giving way to a Tonka. But the little guy always comes back . . .
Chickadees are always checking out my hummingbird feeder. Are they too attracted to the color red? I think they are just curious . . .
My all-time yard list grew by three this year: red-headed woodpecker, blue-winged warbler and golden-winged warbler. Yes, the birding gods were properly thanked . . . While I’m skirting the “anything is possible” category, did you hear about the American anhinga that was sighted over DuPage County on November 18? Or what about that summer tanager that showed up in Gurnee on Veterans Day? Reports like these always make my day . . .
I’ve heard great-horned owls hooting in my neighborhood 11 times so far in 2010. I’m a birder. I take notes. I keep lists . . .
Twitter. It sounds so birdy and yet I just can’t make myself use it . . .
My favorite field trip in 2010 was to Horicon Marsh in Wisconsin. It’s our closest National Wildlife Refuge and the birding is superb. Be sure to take the pontoon boat tour . . .
Dang, I totally missed International Vulture Awareness Day on September 4th . . . The Illinois Young Birders Club was founded in March. What a great idea and kudos to the Illinois Ornithological Society for getting it off the ground . . .
Five Christmas gift ideas: peanut feeder, heated bird bath, better binoculars, 365 Birds calendar and a copy of the awesome new Stokes field guide—the one with the painted bunting on the cover . . . Speaking of Don and Lillian Stokes, mark your calendar: The DuPage Birding Club is bringing them here to speak and sign books on May 12. Watch the club’s website for time and location. Non-members are welcome . . .
Something I learned: Bald eagles and golden eagles are not closely related. Picked that up in an article by Kenn Kaufman . . . The sandwich tern that visited the Chicago lakeshore in September was only the second one ever recorded in Illinois. It even made the news on WBBM Radio 780. Love it when birding gets a little mainstream attention like that . . .
Best license plate I saw in 2010: “Screech.” Below it, a bumper sticker: “So Many Species, So Little Time.” The driver, from Michigan, was a member of the Washtenaw Wingnuts. That’s either a birding club or a minor league baseball team . . . I feel bad for Hedwig . . . Sorry, but you need to adjust your Life List: the whip-poor-will is now officially the eastern whip-poor-will. The American Ornithological Union says so . . . When did you see your first junco this fall? For me it was October 7 . . .
Amazing bargain sighting: 50 pounds of black-oil sunflower seed for $11.98, at Menards. Not an everyday price, but still . . . Favorite headline in 2010, from Bird Watcher’s Digest: “In Praise of Sewage Lagoons: Smelly but Birdy!” . . . I also enjoyed this line, from an online posting by the Evanston North Shore Bird Club: “Our leaders have found some great manure piles, so get ready to tour fields and dairy farms for horned larks, Lapland longspurs, snow buntings, and maybe even a rough-legged hawk!” . . . This might be a good winter for the winter finches like pine siskins and common redpolls. Keep a close eye on your thistle feeder . . .
Place your bids for an original copy of John James Audubon’s “Birds of America.” The book will be auctioned this month by Sotheby’s and is expected to bring at least $6 million. Check your attic, too . . .
Three birds I’ve only seen once and can’t wait to see again: least bittern, cerulean warbler and northern shrike . . . Pack the car: Eagle Watch Weekend at Starved Rock State Park is January 22-23 . . .
Julie Zickefoose simply has a great blog. I’m addicted. Give her a Google . . . If I see only one movie in 2011, it will be “The Big Year,” with Steve Martin, Owen Wilson and Jack Black . . .
And if I read only one book, “The Biggest Twitch: Around the World in 4,000 Birds” . . .
“Bird Feathers,” another new book, is on my want-list too. It’s an ID guide . . .
My New Year’s resolutions: 1) become a regular eBird user 2) join American Bird Conservancy and 3) see a Kentucky warbler . . . I want that Kentucky so bad that I’m offering a bounty. Show me the bird and I’ll write a $25 check to the nature charity of your choice . . .
Oh, and I never did see that black-throated gray warbler at Elsen’s Hill in West Chicago. Sort of pathetic considering it stayed for well over a month and I work only two miles away . . .
Come to think of it, I didn’t get a single “lifer” in 2010. Guess I need to get out more. Let’s all make that a goal for 2011, shall we? Best wishes for a happy new year of birding. The first sandhill crane I ever saw was through a rental car window just outside of Grand Island, Neb. The huge bird was flying low, silhouetted in a soft evening sky. It was one of those “wow” moments in birding that you never forget. I was in central Nebraska to witness one of the birding world’s great spectacles—the annual gathering of up to 500,000 sandhill cranes along the Platte River, the key stopover along their northerly spring migration. “Sandies” were everywhere, roosting on the Platte’s sandbars at dusk and foraging in surrounding corn fields by day. There was even a rare whooping crane mixed in among them, an exciting bonus for the hundreds of visiting birders like me. That was 1998, when I barely knew a kinglet from a kingfisher. Only later did I realize that going to Nebraska in March to see my first sandhill crane was like somebody going to the Super Bowl to see his first football game. And frankly, I had no idea back then how easy it is to see sandhill cranes right here at home. November, in particular, offers prime viewing opportunities as the birds migrate south. You may not see a crane on the ground, but with a little patience you’re almost certain to see one of their noisy flocks passing over—maybe from your own backyard. Cranes are indeed conspicuous in the late autumn sky. Extra-long windpipes serve to amplify their distinctive bugle call, so even high-flying flocks are easily heard. One of my favorite nature writers, Scott Weidensaul, described the sandhill crane’s call as “pure magic, guaranteed to raise gooseflesh on someone hearing it for the first time.” Such reverent words are commonly associated with cranes, which are among the world’s oldest living bird species. They have an almost mythical quality about them. I learned a few things about cranes in October when Joan Garland from the International Crane Foundation (Baraboo, Wis.) spoke at a DuPage Birding Club meeting. There are 15 species of cranes in the world, and only two occur in the United States: the whooping crane and the sandhill. Of the 15 species, 11 are endangered, the whooping crane being the most endangered of all. 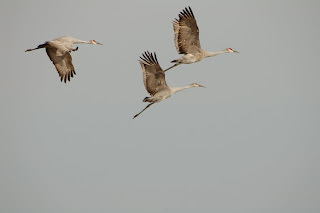 The sandhill is the most abundant crane and is not endangered. In fact, the species is legally hunted in the Central U.S. states. I still find that hard to believe. With seven-foot wingspans, sandies are slightly larger than great blue herons. Unlike herons, however, cranes fly with their long necks stretched straight out. They usually travel in loose V formations, like geese, but on Indian summer days you may see them soaring in a spiral pattern. In those cases they’re riding updrafts of warm air, called thermals, just like hawks and turkey vultures do. The sandhill cranes passing over DuPage and Kane counties this fall likely spent their summers on breeding grounds in Minnesota, Wisconsin or southern Canada. Most of them will now assemble at Jasper-Pulaski Fish and Wildlife Area in northwest Indiana before journeying on to Florida and southern Georgia for the winter. To see cranes in great numbers, Jasper-Pulaski is the place to be from mid-October through early December. It’s the Midwest version of the Platte River spectacle, and it’s a whole lot closer than Nebraska—about 110 miles from DuPage. I’ve only been to Jasper-Pulaski once, and it wasn’t just to watch sandhill cranes. A common crane, a Eurasian species that’s anything but common here, visited the preserve in 1999. Like a few hundred other obsessed birders, some of them self-described “craniacs,” I had to go see. Upon arrival, I’d never seen so many spotting scopes in one place. Some of the people peering through them had traveled great distances. I remember talking to a guy who had just flown in from Baltimore. Yup, just for a bird. Whooping cranes sometimes stop at Jasper-Pulaski, too. They are all white and taller than sandhills so they really stand out. But the mass gathering of sandhill cranes (up to 10,000 birds) is reason enough to make the trip to J-P. You’ll want to be there about an hour before sunset, on the observation tower, to watch the cranes coming in to roost. Enjoy the show! On weekdays I’m usually anxious to get out the door and off to work. But sometimes a “good bird” gets in the way. This occurs most often during the spring and fall migration seasons, and it happened most recently on a Monday in September. It was a backyard brown thrasher that first caught my eye, surely the same one that was hanging around the day before. It was nice to have another look. Of course, my distraction didn’t end with the thrasher. Sorry boss, I’m gonna be a little late. Over there was a ruby-crowned kinglet, in the same tree as a magnolia warbler. And look, a female rose-breasted grosbeak on the feeder! Don’t see that every day. The male was up in a neighbor’s tree, sounding his trademark metallic call note. Chink! A young ruby-throated hummingbird stopped by the nectar feeder. I watched and wondered if this was the last hummer I’d see in 2010. It was September 20, after all. Drink up little fella, you have a long journey ahead. After a half-hour I pulled myself away and left for work. But four hours later my mind was back on birds. I just had to take a little lunchtime walk. Even at noon there might be some birds around. I’m fortunate to work in a park environment, where at certain times of the year there is very good birding less than 100 yards from my office. I’d seen not one but two golden-winged warblers during a noon walk the week before. But on this day all was quiet. Too warm, I guess. It felt like July. The next temptation occurred around 5:20. I was about to shut down my computer and go home but decided to first check the local online birding network. There on the screen was a fresh posting about a black-throated gray warbler, a rare visitor from the western United States. The bird was discovered a few days earlier at the Elsen’s Hill unit of the West DuPage Woods Forest Preserve in West Chicago. Now it had been found again, in the same place, less than two hours ago. So, for the third time on a Monday, I went birding. I’d seen a black-throated gray warbler twice before, each time in Arizona. To see one here would be pretty special. A species that few people will ever see in Illinois was less than two miles from my office! Pulling into the lot off of Gary’s Mill Drive, I was surprised to see only two cars. I parked and set off down the trail, looking for people. I needed an update on the bird and some advice on where to look. Ideally, I would find somebody watching the bird. Darkness was just over an hour away. Up ahead I saw Marilyn and Pete. This was lucky. Both are skilled birders who really know their way around Elsen’s Hill. Pete practically lives there. Elsen’s is not a huge preserve but it might as well be Yellowstone if you’re looking for a tiny gray and white bird. Then again, we had Pete. He’d seen the bird at 4:00 pm and several times in previous days. His knack for finding it was uncanny. Marilyn, like me, had just arrived. Both of us were hopeful but calm. Seeing the bird would be great but just participating in the search was fun, too. We split up temporarily to cover more ground. I stayed with Pete, and within moments we were watching a male black-throated blue warbler. If I saw nothing else this evening it was already worth the trip. The “BTBW” is an uncommon beauty. Marilyn rejoined us about 10 minutes later and just in time to hear a singing gray-cheeked thrush, identified by Pete. It was an unusual song that I’d never heard before. Pete’s “birding by ear” skills are incredible and they greatly aided our search efforts. He knew the chip note of the black-throated gray warbler, and he knew that it sounded just like that of the black-throated green warbler, a common species. 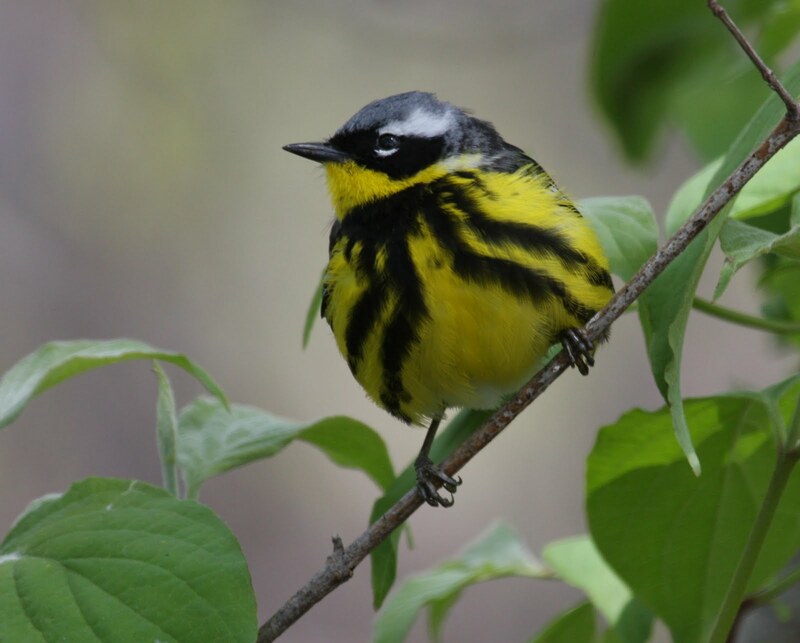 Indeed, there were now three kinds of “black-throated” warblers in play on this night at Elsen’s HIll. Blue, green and gray. We heard and observed several black-throated greens. But the featured bird was eluding us. Pete was trying hard—way too hard for an unpaid guide. He really wanted Marilyn and me to see the black-throated gray. Granted, I had no right to expect success in less than 90 minutes of searching. Bird chases like this require patience and often more than one site visit. Besides, Elsen’s Hill owed me nothing. 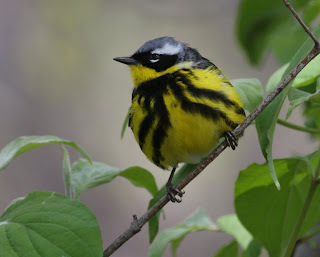 A few Aprils ago it produced my second-ever Connecticut warbler and an olive-sided flycatcher—a very good day. The magic of Elsen’s Hill is well documented. It’s a well-known hotspot for migrating warblers in the spring. I asked Pete and Marilyn about birds that they or others have seen at Elsen’s and the list is astounding. 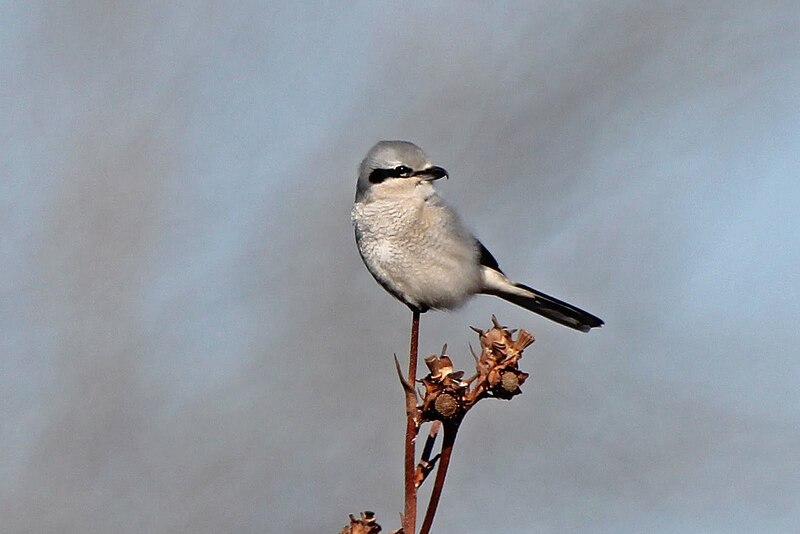 Northern goshawk, Kirtland’s warbler, pileated woodpecker, blue grosbeak, varied thrush, Mississippi kite… Each of these sightings caused a stir among local birders. 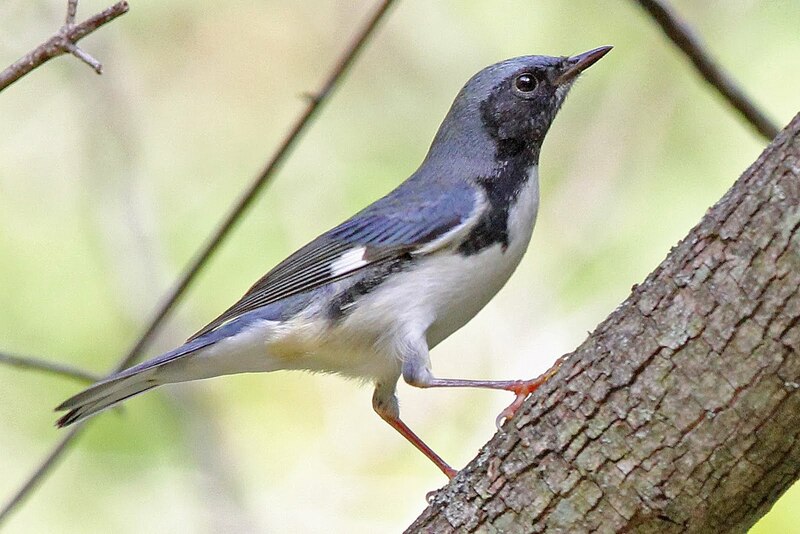 Now the black-throated gray warbler has joined this elite list of Elsen’s Hill rarities. An estimated 100 birders from all over the region came looking for the bird, and many found it thanks to Pete. Day after day he found a needle in a haystack. The warbler was still being seen the first weekend in October. We didn’t find the bird on that balmy Monday evening. Marilyn would have a nice look at it nine days later after 13 hours of cumulative searching. I made several more short visits to Elsen’s without luck. Pete felt worse about this than me, I’m sure of it. Sometimes you get the bird and sometimes you don’t. But the searching is always fun, and the consolation prizes along the way are pretty good, too. Advice to highly endangered bird species: Stay clear of Cincinnati. Fly around it. Don’t land. In particular, avoid the Cincinnati Zoo, my choice for the saddest place in our country’s ornithological history. Two very special birds died at the zoo almost 100 years ago, and each had names. “Martha” was the world’s last known passenger pigeon; “Incas” was the last Carolina parakeet. The birds were quite famous in their day, especially Martha. There was no doubt she was the last of her kind; all the wild pigeons had disappeared. So extinction was inevitable, and Martha’s final years were a death watch. When she passed in 1914, it was the end of what had been the most abundant bird species on Earth. It was a beautiful species too, not to be confused with the urban rock pigeons we all know or the “carrier pigeons” once used to deliver messages. Passenger pigeons resembled mourning doves only larger and more colorful. Their breast was muted orange, the head and back feathers bluish. They lived in deciduous forests throughout eastern North America. Journals from pre-colonial times through the mid-1800s mention flocks of migrating pigeons that “blackened the skies” for hours on end. Aerial streams of more than a million birds were common. Witnesses, including John James Audubon, surely never imagined that the species would soon be just a memory. Habitat destruction, disturbance of nesting colonies and excessive hunting and trapping are the common explanations for the passenger pigeon’s demise. There was demand for the meat, and the birds were an easy mark. Barrels of salted pigeons were loaded onto railroad cars and shipped to market. People also killed them for sport, leaving the carcasses on the ground. The supply of pigeons seemed infinite. But by the 1890s, the skies had emptied. Ever the collector, Gault thought about making the bird his own. “But the day, location and circumstances under which my observation was made precluded the possibility of the capture of the specimen,” he wrote. Eight years later, a bird in Pike County, Ohio, wasn’t so lucky. A young boy shot it, ending the life of the last wild passenger pigeon ever recorded. I’ve been thinking a lot about that bird, about Martha and about passenger pigeons in general ever since June. During a Midwestern “baseball road trip” with my son, I crossed paths with a historic marker and later a full-scale monument, each dedicated to the passenger pigeon. It was pleasing to see the pigeon’s story remembered. We found the marker at a rest area near Tomah, Wis. I’d been wondering how the species got its name and the tablet answered my question: it derives from an Indian word meaning “wanderer.” Passenger pigeons apparently traveled up to 100 miles a day during nesting season searching for food. Acorns and chestnuts were preferred. There is a good reason for the sign’s location. The largest nesting colony of passenger pigeons ever recorded occurred in the area, in 1871—an estimated 136 million pigeons covering 850 square miles! A few days later I was birding at Wyalusing State Park, a beautiful spot along the Mississippi River in the dairy state’s southwest corner. My search for a Kentucky warbler failed, but I felt richly compensated by a visit to the passenger pigeon monument on Sentinel Ridge. It recalls the last known pigeon ever shot in Wisconsin, in Babcock, in September 1899. There are other flightless ones, of course, of the stuffed variety. You can see passenger pigeons on display at the Field Museum in Chicago and also the Jurica-Suchy Nature Museum at Benedictine University in Lisle. You can even visit Martha. She’s mounted in a glass case at the Smithsonian in Washington. At least there is an upside to all of this. Martha’s death brought national attention to the tragic story of her species. In turn, early bird conservation efforts in America received a jump start, leading to the landmark Migratory Bird Treaty, enacted in 1918. The law was too late to save the passenger pigeon, but it delivered vital protection for other persecuted species. I’m pretty sure that a purple martin could poop on Ray Feld’s head and he’d just smile. Then he’d calmly wipe off his silvery scalp. That’s how much he loves these birds. Feld, as a hobby that he admits borders on obsession, watches over three thriving purple martin colonies. The largest and oldest is at Armstrong Park in Carol Stream. The second is at the BP Naperville Complex, where Feld is employed. The third, and the one I know best, is located at Cantigny Golf off Mack Road in Wheaton. Saying Feld watches over the birds is a big understatement. Caring for a martin colony is a lot of work. I know this better than ever having attended a presentation Feld gave at the Cantigny site in July. About 40 other birders and I listened and learned about these fascinating birds, and what it takes to maintain and grow a colony. 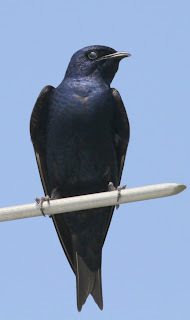 Purple martins are the largest swallow species in North America. The adult males are dark and glossy with a purple sheen. Young birds and females are brownish with light-colored bellies. What really sets martins apart is their preference for man-made housing and for being around people. In a sense they are like wild pets, highly dependent on humans for their existence and preservation. To thrive, purple martins actually need “martineers” like Ray Feld. Like bluebirds, they need specific habitat, too. Martins feed exclusively on flying insects, so nesting sites must offer plenty of open space. All the better if a pond or lake is nearby. Still, even with the right habitat, attracting martins can take a lot of patience. This year, after 23 years of waiting, purple martins finally took up residence on Feld’s own property in Winfield. He’s still gushing about it, and rightly so. Three years ago Feld erected a martin house at the Morton Arboretum in Lisle. Despite excellent conditions at the site, martins have yet to move in. Success, however, was relatively instant at Cantigny Golf, a habitat Feld calls “just about perfect.” Working with golf course superintendent Scott Witte, Feld installed a martin “castle” in fall 2004. A pair of martins moved in the very next spring. “That’s almost unheard of,” Feld says. Cantigny was thrilled too, since hosting a purple martin colony further supports the golf course’s status as a Certified Audubon Cooperative Sanctuary, a designation held since 1993. Some 55 bluebird nesting boxes are also on the Cantigny estate, monitored by Feld, his wife Cecilia, and Mike Nizetic, another Cantigny volunteer. The martins alone require many hours of Feld’s attention from April through July. He’s one of Cantigny’s most devoted volunteers, and knows that keeping the birds healthy and safe is essential to growing the colony. That’s good for Cantigny and good for the species in general, throughout the region. 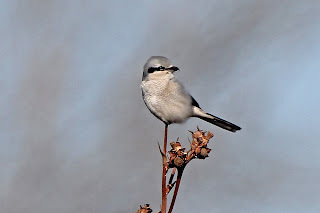 Martins are site loyal, traveling from their wintering grounds in South America to the same nesting location every spring—sometimes to the very same house compartment they used the previous year. When the birds reappear in early April, Feld has everything ready. He’s the ideal landlord. Nest compartments are lined with pine needles to protect the birds in case of extreme cold. Baffles are mounted to the poles to guard against raccoons. Wire perch towers are positioned near the houses. And very importantly, unwanted non-native birds like house sparrows and starlings are quickly evicted. Martins raise one brood per season, with three to seven eggs per clutch. Soon after the eggs hatch, Feld replaces the original nest with a Styrofoam insert. This reduces nestling mortality by protecting the young birds from blood-sucking parasites. The adult martins are not bothered by the nest swap or by Feld handling their babies. Clearly Feld’s efforts are paying off. Fifteen pairs of purple martins are living at Cantigny this summer, up from 11 in 2009 and 8 in 2008. Feld keeps careful records of nesting success, too. This year, 80 eggs were laid, 59 hatched and 55 of the babies fledged. This is nearly double the number of fledglings in 2009. A second housing unit was installed at Cantigny in 2008 to accommodate the baby boom. Feld says he may hang a cluster of hollowed gourds to provide even more nesting space for the 2011 season. Martins begin their long southern migration this month. A few birds may hang around DuPage until late August, but your best chance to observe them is next spring. 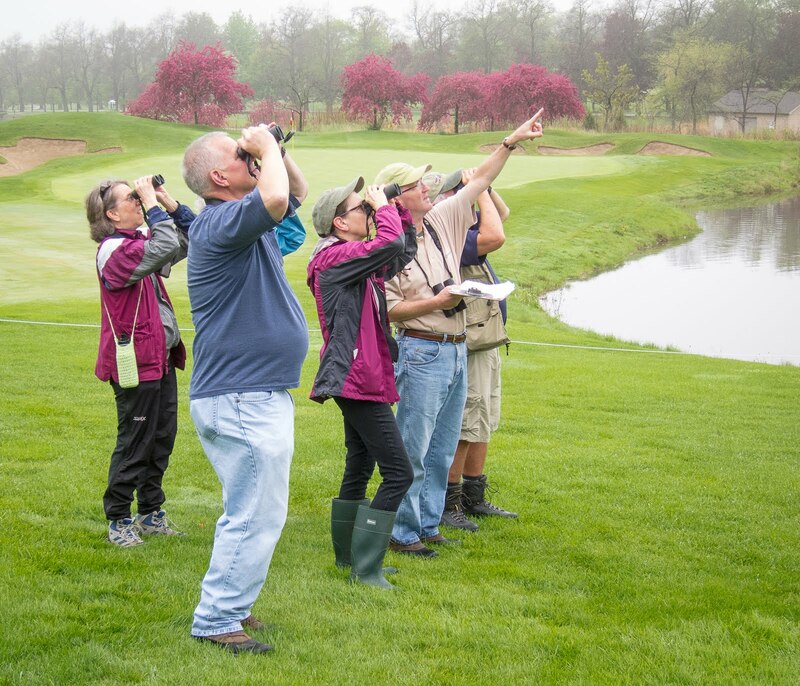 Birders are welcome to visit the Cantigny Golf colony, located across from the main parking lot. Look for the green street sign that says Purple Martin Place. In a recent column I suggested a trip to the Horicon Marsh Birding Festival in Wisconsin. I didn’t make it to that May event, but I did visit the marsh a few weeks later, on an overnight field trip with Kane County Audubon. It was a 24-hour birdathon that I won’t soon forget. Horicon is in farm country, about an hour northwest of Milwaukee. I’d been there just once before, by myself in 2002. This time I’d see more of the 32,000-acre marsh, and experience a bit of the small-town life that surrounds it. It was nice to be with like-minded souls. Our group was small, just seven birders, but we had large ambitions. How many species could we find? What rarities might we see? The possibilities were exciting. And of course we looked forward to resident Horicon specialties like black tern, Forster’s tern, yellow-headed blackbird, sandhill crane, bald eagle and American white pelican. Our party set off from Elgin, early on a Saturday morning. We reassembled about three hours later in downtown Horicon, a city of 4,000. After much-needed coffee and a late breakfast at Mother’s Day Restaurant, we headed to an observation deck and trailhead just outside of town. This spot (go north on Palmatory Street from Route 33) is a great place to start. The panoramic view from the deck introduces the massive scale of this designated “wetland of international importance.” Horicon is the largest freshwater cattail marsh in the United States. An active purple martin colony is adjacent to the deck and parking lot, and from here we began a long, slow hike through a mix of habitats. Horicon supports far more than ducks, geese and marsh birds. It’s a haven for grassland and woodland species, too. Birds we’d see or hear included black-billed cuckoo, red-headed woodpecker, wood thrush, great-crested flycatcher and six out of six possible swallow species. Horicon can also be a fabulous place for warbler watching in May, but we were about a week too late to catch the wave. The only warbler species we observed were the local nesters—American redstart, common yellowthroat and yellow warbler. The latter two are marsh-loving birds and proved to be constant companions throughout the weekend. Yellow warblers were positively abundant. The same goes for marsh wrens. Their bubbly chatter was the background music for our visit, punctuated every so often by the unmistakable whinny of a calling sora. These are the sounds of a thriving wetland, and the better ears among us were able to identify another Horicon denizen, the Virginia rail. We only made eye contact with two rails all weekend, one sora and one Virginia, a testament to their stealthy lifestyles. Eventually our post-breakfast hike led us to the new Horicon Marsh International Education Center, another good spot to enjoy an elevated view of the landscape. Completed in 2009, the center (horiconmarsh.org) offers exhibits and free maps, bird checklists and other Horicon literature. A short film in the theater gives an overview about the marsh, which has a fascinating history involving man vs. nature. In general, nature has been winning since the late 1920s, when efforts to drain the marsh and convert it to farmland were finally abandoned. In 1927, Wisconsin established the Horicon Marsh State Wildlife Area. This occupies the southern third of the marsh and is managed by the state’s Department of Natural Resources. In 1941, the federal government purchased the rest of the marsh, creating Horicon National Wildlife Refuge. This was our group’s next destination as we headed for the marsh’s northern boundary along Highway 49, just east of Waupun. Passing traffic aside, the roadside birding here is terrific; pullover space is more than adequate. Redhead ducks, ruddy ducks and black terns were plentiful on the north side of the road, with a few yellow-headed blackbirds in the cattails beyond the open water. More treasures awaited on the south side on some exposed mudflats. A male ruddy turnstone in full breeding plumage was a nice discovery, and this is where we enjoyed a glimpse of that Virginia rail. We also found a black-crowned night heron and common moorhen. Here and everywhere during our visit, herons, egrets and white pelicans were never out of view. At 6 p.m. we reported back to the village of Horicon to board a pontoon boat at Blue Heron Landing. The two-hour “birding adventure” at sunset would be a highlight of the trip, thanks in large part to professional guide Marc Zuelsdorf. Marc’s been running the tours for many years but brings a fresh enthusiasm to his work. He clearly loves Horicon Marsh and enjoys showing off its birds. And there is always something interesting to share. Marc noted that 301 species have been documented at Horicon, and his personal Horicon life list stands at 240-plus. Perhaps the most conspicuous Horicon resident and a favorite of many birders is the American white pelican. Marc said the first pelicans arrived at Horicon just 13 years ago, a day he recalls as if it were yesterday. Now, with up to 700 nesting pairs, this is Wisconsin’s largest nesting colony. The return of bald eagles to Horicon is another great story. Two pairs are now nesting on the refuge. Ospreys are present, too—a nesting platform was installed just this year and is already in use. We saw lots of birds and a dazzling sunset as Marc guided us through a main channel that’s part of the Rock River system. Everyone in our group felt the $18 ticket was a bargain. Canoe and kayak rentals are available at Blue Heron Landing as well. A late dinner at the Rock River Tap in downtown Horicon proved that bikers and birders can easily share the same space. The service was slow, the food was just fair and the beer was cold. In other words, we were delighted. We left the joint satisfied and ready for a good night’s sleep at the Mayville Inn up the road. Other cars on the dusty Dike Road signaled that we were not the only birders on a mission. A driver heading east as we headed west told us the ibis was up ahead and not far from the road. So too were a pair of black-necked stilts, another uncommon species. Within minutes we were “on” the ibis, enjoying excellent close-range views as the bird foraged in some old cattail stalks. This was too easy! The stilts were in the same general area, also feeding close to the road. With the temperature approaching 90 and no shade in sight, we decided to head back to the north end of the marsh and try the floating boardwalk trail. Parts of it pass through a woodland and it felt good to be out of the hot sun. We found a rose-breasted grosbeak and some bobolinks in a neighboring field, but our best sighting was a yellow-throated vireo at its nest. Driving back to Glen Ellyn that afternoon, I had plenty of time to think about all the birds we saw (and a few we didn’t see) at Horicon Marsh and surrounding Dodge County. Our weekend tally was 92 species—a good outcome considering the scarcity of warbler and sparrow species. 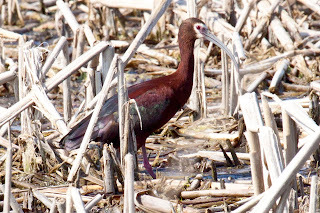 We’d have liked to see a few more rarities given that sightings of glossy ibis, American avocet and a lone whooping crane had been reported in recent days. 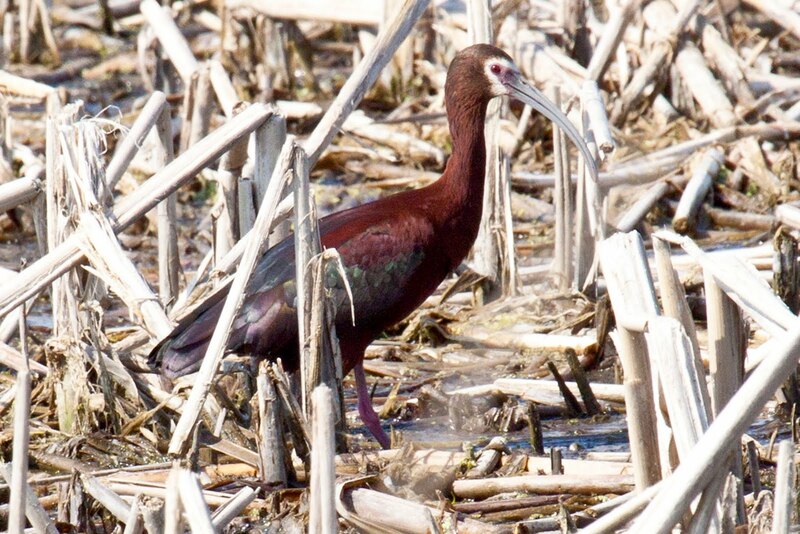 Horicon seems to be a magnet for special birds, like the white-faced ibis we encountered. My favorite sighting, however, was a close-range view of a male northern harrier, hunting low over a grassy field. Known to birders as the “gray ghost,” this raptor can leave a big impression on those lucky enough to see it. Horicon itself has that effect. Go explore it for yourself, and spend a whole weekend there if you can. This is one of the Midwest’s top birding destinations, and we’re fortunate to live less than 175 miles from its boundaries. If you’ve read this column before, you know about my precious yard list. Next to my life list, it’s my favorite diary. In early May, however, it became a little less pure. Or maybe not. I’m still pondering what happened. First, a little background. Many yard list species have never physically entered my space. That’s not a problem. Most people count birds they can see from their yard, so a bird perched in a tree two houses away “counts,” as does a bird flying over. The rule of thumb is that the observer must be stationed on his or her property when the sighting occurs. Usually that is the case, such as on May 3 when, from my back patio, I spotted a red-headed woodpecker high in a neighbor’s tree. This was an exciting find—one of my favorite birds, and No. 109 on a yard list that began the day we moved to Glen Ellyn in 1997. These days, growing the list is a big challenge. It takes a lot of watching and luck to add one or two new species per year. So there I was, not expecting much, the day after the red-headed woodpecker sighting. It started with a buzzy sound from the yard next door. I knew it was a bird but that’s all. My view was blocked by a hedge, and this bird seemed to be low and staying put. The unusual song kept repeating, so after a couple of minutes that seemed like 10 I decided to go around the hedge and try for a visual. This worked out well, because in a moment I was eye-to-eye with a blue-winged warbler! Another new species for the yard list! Wait a minute boy, not so fast. It was a blue-winged warbler all right, no doubt about that. I’ve seen a few of them before. But when I spotted this one I was standing on my neighbor’s property, six feet south of my own. After making the ID I scurried back into my own yard, hoping to see or hear the bird. Nothing. The bird was gone. So, does it count? Or put another way, do I deny myself yard bird No. 110 due to a technicality? Am I nuts to even be worrying about this? Absolutely! The bottom line is that I counted the bird: blue-winged warbler, No. 110. I did hear and see the bird, after all, and this wasn’t just any bird. It was a premium, out-of-place migrating species that I’ll likely never see again outside my back door. It deserved to be documented. So you see, I did this for the bird. In the end, those of us who keep lists make our own rules. It’s a highly personal matter. A few birders, very few, will add a bird to their life list if they just see it fly, relying on the field trip leader for the identification. Most are lot more scrupulous, applying a code of honor that ensures the highest level of list integrity. It helps us sleep at night. It also keeps the birding police at bay. Nobody wants a visit from the Federal Bureau of Bird List Investigations. If the bureau comes to my place, I’ll calmly tell my story just like I’ve told it here. 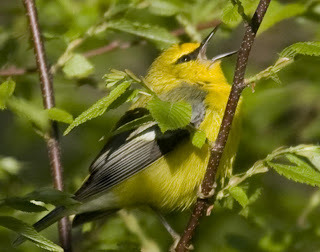 Then, if they insist, I will remove blue-winged warbler from my yard list. But as soon as their white van with black letters on the door is out of sight, I’ll put it back on. House rules! In 2009, National Audubon Society’s board of directors elected Holt Thrasher as chairman. He succeeded a woman named Carol Browner. So the top leadership went from Browner to Thrasher. At the time, Audubon’s president was John Flicker. I’m not making this up. Mr. Flicker resigned recently—migrated to another job or into retirement I suppose. It will be interesting to see who replaces him. Audubon’s Missouri office is headed up by Tony Robyn. He seems like an ideal candidate for promotion. People names can be amusing, and bird names even more so. Scores of non-birders out there seem to love saying “yellow-bellied sapsucker.” It’s a great name, I agree, but why stop there? The world contains about 10,000 bird species and each has a scientific name and at least one “common name.” Many birds have intriguing nicknames, too. Most bird names are far less exotic and some are probably too plain. Handsome species like the black-and-white warbler and yellow warbler deserve better. I’d change the black-and-white’s name to “zebra warbler” if given the chance. Oh, I could fix a lot of bird names if the ornithology police would just let me. First on my list would be the red-bellied woodpecker. Anybody seen that red belly lately? “Faint wash of red on belly rarely visible,” says the Sibley field guide. Precisely! When a bird is named after a field mark, let’s choose a field mark that is a little more obvious. It’s the same issue with orange-crowned warbler. Last October, however, when birding at Morton Arboretum, I got a nice close look at this rather drab warbler. For a second, for the first time ever, I saw an orangish smudge on the bird’s crown. I think. Red-headed woodpecker, now there’s a well-named bird. It has a red head and it pecks wood. I’m partial to bird names that depict both appearance and behavior. Swallow-tailed kite. Black skimmer. Brown creeper. Yellow-breasted chat. Perfect. Some bird names give us both a visual and audio clue. Black-capped chickadee, for example, and gray catbird. Others are named after their songs alone. This can work quite well, as with mourning dove, bobwhite and whip-poor-will. Other times not. I’ve listened to dickcissels but I don’t hear them saying “dickcissel.” Maybe they’re saying I need new ears. Geographic names can be even more confounding. Some warblers are named after states or cities where they were discovered, presumably during migration. Connecticut warblers are quite rare on the East Coast and do not live in Connecticut at any time during the year. 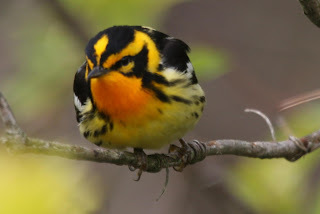 Tennessee warblers do not live in Tennessee. 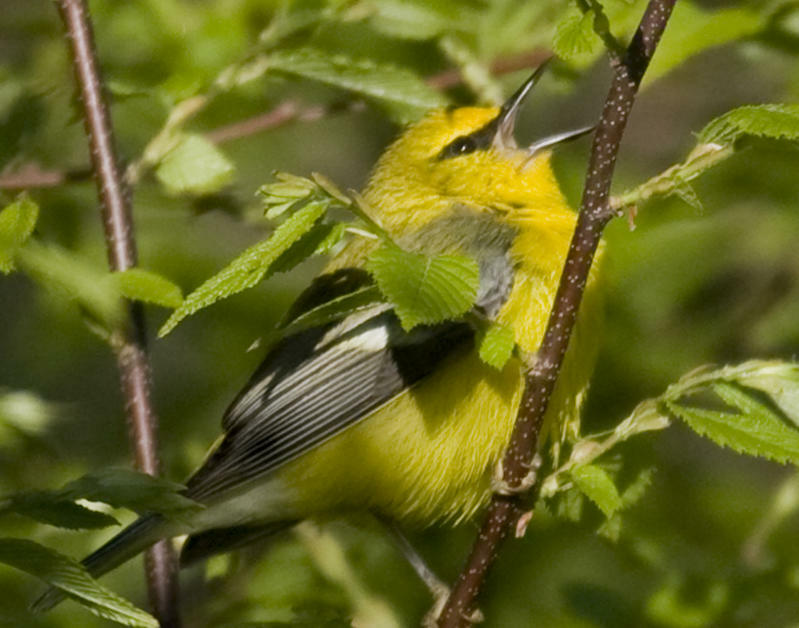 Nashville warblers do not sing country music songs and could just as easily been named after Peoria or Milwaukee. It was chance, nothing more. Baltimore oriole makes more sense. The species was named for the first baron of Baltimore and founder of Maryland, George Calvert. His family colors were orange and black, like the bird. If his colors had been black and purple, we might now have a Baltimore grackle. If I may pick one more bone, let’s make it the magnolia warbler. This is a beautiful bird to watch for in May as it migrates through our region. But don’t get too focused on magnolia trees. “Maggies” are just as likely to appear in maples and oaks. Alexander Wilson, known as “the father of American ornithology,” collected the type specimen. When he shot it, the victim happened to be perched in a magnolia. I wouldn’t suggest that we change a lot of bird names, especially the ones based on random occurrences. That would be tampering with history. Discussing bird names would also be a lot less fun. Just be aware that the common names given to birds often have no connection with science. For more on this subject, check out “Dictionary of Birds of the United States,” by Joel Ellis Holloway, and “100 Birds and How They Got Their Names,” by Diana Wells. Each book is loaded with interesting facts and anecdotes. Want to feel better about your car, especially if you drive a Toyota? Here’s my advice: Get a pair of those Illinois license plates with our state bird, the northern cardinal. In December I finally took the plunge, plunking down $70.44 for the state’s “environmental” tags. Hopefully some of that money actually does some good. But I know this, my 2003 Corolla has never looked better. Recall my car if you must, just don’t mess with my plates! By sight and sound, we know this bird well. Cardinals are reliable backyard visitors and impossible not to notice. 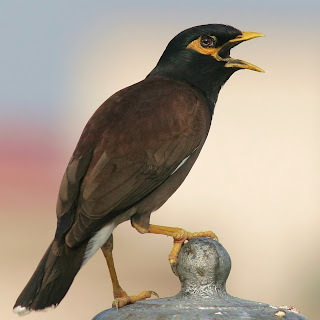 Since mid-February, on clear mornings, maybe you too have heard the males singing from high perches. Their loud, clear whistle is one of the best harbingers of spring. 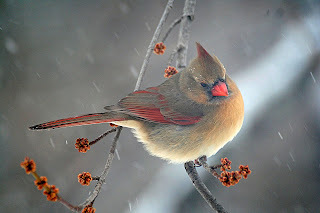 1) The highest concentration of cardinals in the U.S. is thought to be in Louisiana and Mississippi, reflecting the fact that our “northern” cardinal was once a predominantly southern species. Northward range expansion began in the 1800s and accelerated in the 20th century. 2) Cardinals (or “Virginia nightingales”) were once commonly trapped in the south and sold as cage birds. Many were shipped to Europe. 3) Cardinals sing 8 to 10 different songs. A robin may sing 70! 4) Both males and females sing when nesting time approaches. Female cardinals sing from the nest when they’re hungry, so the male knows to bring her food. You may even hear a cardinal in the middle of the night—if you do, it’s probably a female. 5) The oldest cardinal on record lived 15 years. A typical life span is 2 or 3 years. 6) Cardinals generally stay put. They are non-migratory and may range only a few miles during their entire lifetimes. 7) Cardinals are loyal mates with strong pair bonds. This spring, watch for the so-called “courtship kiss” when a male passes a seed from his bill to the female’s bill. 9) Cardinal territories are typically 2 to 10 acres and males defend them aggressively. In winter, they are not as territorial and form feeding flocks. 10) A cardinal’s foremost food and nest site competitor is the gray catbird. 11) Juvenile cardinals have dark bills and a plain face (no black mask). 12) The female cardinal has a country music theme song: “She Don’t Know She’s Beautiful,” by Sammy Kershaw. OK, I made that last one up. But please make a point to examine the female closely, from head to tail. The beauty of her subtle coloration is undeniable. Naturally the flaming-red male gets all the attention. And small wonder the cardinal is the most popular state bird by far. Kentucky adopted it in 1926, and six more states followed. Ohio is a cardinal state too, but I possess a cherished piece of birding memorabilia that claims otherwise. A few years ago, during a stop along the turnpike, my son and I paused at one of those machines that press an image onto a penny. Jay has a collection of flattened coins stamped with places we’ve been or things we’ve seen (he loves turning the crank). At this particular machine near Toledo, one of the imprint options was “Ohio State Bird: Black-Crowned Night Heron.” Say what? Does the governor know about this? I love night herons, but I’m quite sure the species was never a Buckeye State icon! For Ohio, Illinois and the other states, the northern cardinal was a good choice. The species deserves our admiration. And like many other common birds, it merits closer observation. Let’s watch our cardinals more carefully, and listen to their calls and songs with a keener ear. For birders of every ability level, cardinals offer one of the most conspicuous backyard learning opportunities around. Bald eagles in DuPage? Absolutely! It doesn’t take much to get me thinking about eagles. The latest trigger was the cover of Audubon. It shows two sparring bald eagles, the spectacular Grand Prize-winning image in the magazine’s inaugural photo awards. Most people love eagles, and not just birders. Is there an American over age 4 that would not recognize one? Best of all, their population is growing. The odds of seeing a wild bald eagle here in DuPage County have never been better. Last September, at Ottawa National Wildlife Refuge near Toledo, the first bird I spotted was a bald eagle on the wing. Was this a trained bird, commissioned to greet and impress first-time refuge visitors like me? No, the bird was simply patrolling its home territory—one of several resident eagles at Ottawa. It was also the first eagle I’d ever seen in Ohio, my home state. As a young boy in Canton, a flyover flock of Canada geese was an exciting and somewhat rare occasion. We’d stop what we were doing to marvel at the occasional V-formation. But the chances of a bald eagle sighting were zero. In the 1970s the species was fighting for its very survival. Pesticide poisoning had pushed our national symbol to the brink of extinction. Fortunately, some smart people acted just in time. DDT was banned in 1972, and the Endangered Species Act debuted a year later. These steps allowed bald eagles to stage a remarkable comeback that continues today. The species has been off the federal list of endangered and threatened wildlife since 2007. On the Dec. 19 Christmas Bird Count, seven bald eagles were spotted in DuPage and eastern Kane counties. The sightings were mostly along the Fox River, but one occurred at Blackwell Forest Preserve in Warrenville. At Greene Valley Forest Preserve in Naperville, where the DuPage Birding Club studies raptor migration each fall from the top of the landfill “mountain,” some 21 bald eagles were sighted during the 2009 count period. Three golden eagles flew over too! Of course I dream of spotting an eagle soaring high over my yard. Hey, it could happen. It did happen for Candace Barry outside her home in West Chicago. She encountered a baldy last October when taking pictures of the fall color. She first saw it on the ground just 50 yards away and then managed a few good photos of the bird in flight. Of course, for most of us, a backyard eagle is a long shot. We’ll need lots of patience and luck. But what about seeing an eagle now? We have some options. Rather unbelievably, a few birds can be viewed this time of year at the Little Calumet River on the far south side of Chicago. They’ve been visiting every winter since 2004 according to Joe Lill of the Chicago Audubon Society. The 9th Ward, not known for its scenic beauty, treats the eagles like celebrities. The Mississippi and Illinois Rivers are even more of a sure thing. In winter, bald eagles congregate near the locks and dams, grabbing fish where the water stays open. For anyone who appreciates nature it’s a spectacle not to be missed. The nearest highly reliable viewing place is Starved Rock State Park in Utica, about 85 miles south of central DuPage County. For some excellent eagle watching, go to the Illinois Waterway Visitors Center between now and early March. The center is located at lock and dam #4 on the Illinois River, across from the park. More information is online at flocktotherock.com or call 800-746-0550. Meanwhile, don’t give up on adding a bald eagle to your yard list. Broadly speaking, the birds are most definitely in the neighborhood.